If you are a power boat owner, you know the importance of your boat’s transom. The transom is responsible for both transmitting the power from the engine to the rest of the hull and for carrying the pounding of the hull back to the engine. Because of its location and its function, the transom of a boat often becomes weakened over time. This weakening comes as a result of normal wear and tear, weather and rotting that naturally occurs. Anchor Marine Repair of Minneapolis/St Paul can complete transom boat repair when you need it and get you and your boat back on the water fast. When your transom is damaged, you may also find that there is damage to other surrounding areas including the floor and stringers, three of the most important parts of your boat. If these three parts are not functional, you are not safe on the water. Repair is critical and Anchor Marine Repair will be able to access any and all damage to and around the transom and make the necessary repairs. 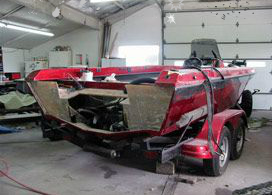 Anchor Marine Repair is the leading boat repair company in the entire Minneapolis area, and specializes in transom repair, fiberglass repair, metal flake repair, and aluminum boat repair for collision, structural, and storm damaged boats. Our team uses only the highest quality materials for our boat repairs and can pick up or deliver your boat if you are located within 250 miles of the Minneapolis/St Paul area. Our state of the art facility includes two buildings that boast a combined 10,000 square feet of space to complete repairs. These buildings can accommodate boats that are up to 38 feet in length. If you’re boating on a lake around here, we can handle your watercraft! The technicians working at Anchor Marine Repair each have more than a decade of experience working at our facility and have a passion for boats and boating. They understand that each and every boat is different and are committed to completing the most comprehensive boat repair possible for the money. We can restore your boat back to its best possible condition fast so that you can spend more time on the water and less time with your boat in the shop! Call Anchor Marine Repair at 763-972-3540 for more information about the various services we provide, or to set up a time for us to come pick up your boat for repair.